Free accounts for bookseller reference libraries! 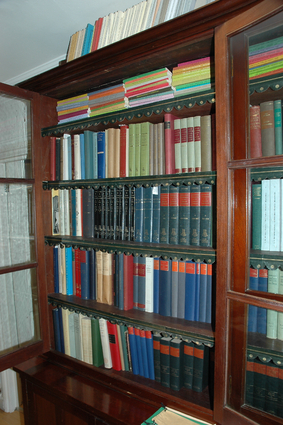 A good reference library is a must-have for any bookseller, but having a wide range of useful reference sources at hand is particularly necessary for the booksellers who operate at the used/rare/antiquarian end of the spectrum. If you’ve ever had a chance to browse through a really good bookseller reference library, you’ll know immediately what I’m talking about (and, like me, you’ve probably had to be practically dragged away from the shelves). Brooke Palmieri, a bookseller at Sokol Books, Ltd. in London (read a profile of Brooke from the Fine Books Blog’s “Bright Young Things” series here, or check out her excellent blog, 8vo), has been cataloging Sokol’s reference library on LibraryThing (Sokol_Books_Ltd), and that got me thinking about ways we might be able to encourage other booksellers to use LibraryThing for their reference collections. A good first step: free accounts for everyone! Just open an organizational account on LibraryThing and email me (jeremy@librarything.com) with the username you choose, and I’ll upgrade it to lifetime status. You commit to adding your reference library to LibraryThing. It doesn’t have to be immediately, of course; booksellers are some of the busiest people I know! You’ll have a useful catalog of your reference books, and the world will be able to (virtually) browse your shelves. And if you want a hand cataloging, let me know that too – we can almost certainly pull together a merry band of LibraryThing volunteers to come help sometime (and, ahem, do some shopping too!). Huge thanks to Brooke for providing the impetus for this, and for the picture (a portion of the Sokol Books collection). She noted on Twitter this morning that the reason she started cataloging on LT was that the library “isn’t consistently organized & I when I first started working I needed to learn its contents FAST. I have heard horror stories of firms owning multiple copies of expensive bibliographies because their libraries are disorganized … so cataloguing a ref library saves 1) time 2) money 3) teaching other employees what you have committed to muscle memory.” If we can help at all with any of that, we’re happy to! Mmm, bookstores. For more ways to use LT, see our How Bookstores Can Use LibraryThing page. * If you’re a bookseller and not a member of those assocations, but have a large reference library you want to catalog on LibraryThing, just email me; we’ll make it work.